Cl. 1. 'A'(3/2) 'Z'(0/0) H-neg. 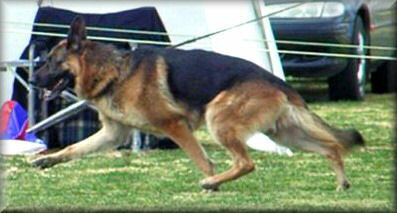 On the 7th March 2004 at the German Shepherd Dog Club of Victoria 74th Championship Show. Louie came 15th Open Dog graded Excellent. On 2nd May 2004 at the G.S.D.C.A.Inc. National Championship Show, Louie came 30th in Open Dog graded Excellent . 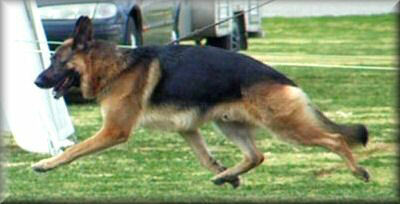 On 14th August 2004 at the Broken Hill German Shepherd Dog Club of N.S.W. Inc. Louie won Open Dog, graded Excellent, Challenge Dog & Runner up Best of Breed. 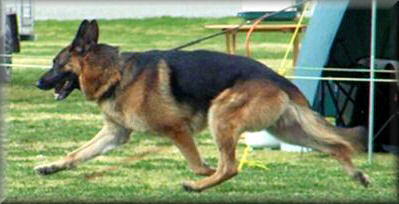 On 15th August 2004 at the Broken Hill German Shepherd Dog Club of N.S.W. Inc. Louie came 2nd in Open Dog graded Excellent, & Reseve Challenge Dog. Critique: Double P1 upper left. A medium size, just medium strong, very well coloured, well pigmented, expressive animated typey dog. Very good head and expression, broad skull, strong upper and lower jaw, dark eyes, very good strength of neck, high withers, straight back, well laid just slightly short croup, upper arm of good length but should be slightly better laid, very good hind angulation, balanced fore and under chest, very good length of foreleg, stands correct in front. Steps correct front and rear, positions of steps correct in front but there is a slight stepping action in the forehand. During movement shows very good drive and reach through a firm back. Critique: Double P1 upper left. 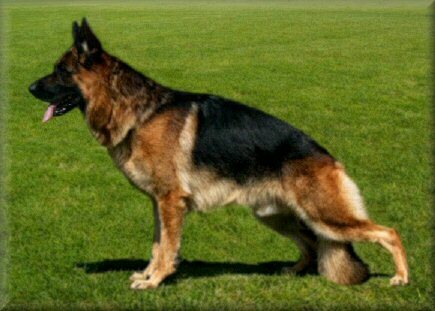 Large, medium strong, substantial masculine dog of very good type, very good head and expression, dark eye, stands with very good wither with nick behind, slightly short, slightly steep croup, very good fore and hindquarter angulations. Stands correct in front. Steps slightly loose going, elbows are still to firm. Good movement with a slightly high stepping action. On 9th of October 2004 at the Shepparton Agricultural Society Inc. Championship Show. Louie won Open Dog, Challenge Dog & Best of Breed. Judge: Mrs G. Apted. Critique: Double P1 upper left. Large, strong, expressive masculine slightly elongated well coloured well pigmented male of very good type. Very good head with just a slight roman nose, the eyes should be a fraction darker. Excellent neck and topline, very good underline. Very good forechest, very good angulations of the fore and hindquarter. Pasterns should be a little firmer. Shows very good ground coverage with very good reach and drive where the backline remains firm. Needs a little more animation on the move. Critique: Double P1 upper left. A very expressive, well pigmented strong dog, with a very good head. High wither, firm back and a good length and lay of the croup. Constructed in the correct body proportions, with good fore and very good hindquarter angulations. Stands absolutely correct in front. Front pasterns should be a little firmer. Straight sequence of steps. Very good movement, fleet footed, with very good ground cover. On the 21st November 2004 at the Garden State Kennel Club Inc. Championship Show. Louie came 2nd Open Dog. In 2004, Ch. 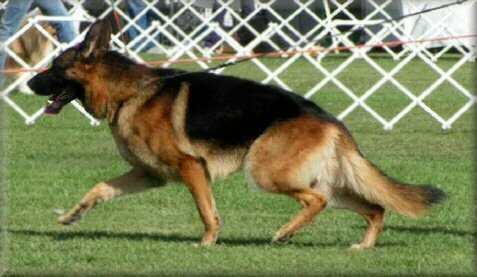 *Bodecka Grandslam "Louie" was the German Shepherd Dog Club of Victoria Inc. Specialty Show Dog of the Year Trophy winner & also the Schneider Trophy winner of the Year.